"I will stand on the same mountaintop to breathe, feel and see the beauty of nature and experience once again the feeling of peace and serenity in my soul that mother nature brings!" It has been few years since I went to Banff [Alberta, Canada] but the breathtaking view of the mountains, waterfalls and the river valley still linger on my mind. This place has been one of the natural things that I have seen in amazement and awe. Another spectacular scenery that our mother nature has to offer. As I recall vividly, I was standing on one of the mountains surrounding the area. In a so called Sulphur mountaintop where I stood, I saw the view of the mountains, some parts covered with clouds and ice, the seemingly endless beautiful river valley which looked like a zigzag road leading the waters to God knows where (lol) and the castle-like hotels that look like ants. And when you look at it down below, it made me cry out WOW! What a view! And how great our Creator is! For me, Banff is like a PARADISE on EARTH so to speak! Anyways, maybe some readers are wondering how I got to see the place. I did not climb the mountain nor rode on a helicopter or a plane to get there (maybe someday I will though. lol). To get there, a Banff Gondola is available to ascend into the mountain. It is cable car that will transport people from another mountain to the Sulphur mountain. Thanks to whoever invented cable cars, anybody can now set foot on a mountaintop without any diffuculty. Take note Guys, Gondola ride is sooooo much fun! 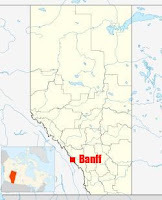 For more info about Banff....It is a town within Banff National Park in Alberta. Known for its mountainous surroundings and hot springs, it is one of Canada's most popular tourist destinations. Same as Jasper, it is also a destination for hiking, biking, skiing and other fun-filled stuff. The United Nations declared Banff National Heritage site in 1985. Although I have not been there for quite a while, for sure I will go visit it again in the summer and as always, I will stand on the same mountaintop to breathe, feel and see the beauty of nature and experience once again the feeling of peace and serenity in my soul that mother nature brings! By the way, my blog Ang Kalsada is already gone, you can follow my new photoblog. It's in my profile. Thanks. Anyway bat naman nawala un. sayang naman. ganda pa naman ng blog na un. yah i had so much fun!i hope to see more beautiful places in the future and share my experience with u guys!